The Winnipeg Jets return to action tonight against the Calgary Flames after their four-day Christmas break…The Jets have won two in a row to end their three-game road trip before the break, finishing the stretch 2-1-0…The last game was a 1-0 win against the Vancouver Canucks on Saturday…The Jets play the second game of this two-game homestand on Saturday afternoon against the Minnesota Wild. Winnipeg is 13-4-2 at home this season, which is tied for the third-most wins and the second-most points in the NHL…After going 8-for-15 (53.3%) on the power play in their last four home games, the Jets have regained top spot in the NHL in power play percentage at home this season at 36.8% (21-for-57)…Winnipeg’s 21 power play goals at home this season lead the NHL…The Jets have a 45-11-4 record at Bell MTS Place during the last two seasons, making it the toughest building in the NHL for opposing teams to play. At 24-10-2, the Jets became the first Western Conference team to reach 50 points this season with their win against the Canucks on Saturday…The Jets reached the plateau in 36 games, which is three games quicker than last season…Winnipeg is the third team in the NHL to reach 50 points this season. The Jets have compiled 113 points so far in the 2018 calendar year by going 52-19-5 in 78 games…Winnipeg was one of three teams in the NHL to reach 112 points or more in the calendar year…It establishes a new benchmark for wins and points in a calendar year since the franchise relocated to Winnipeg in 2011…Winnipeg’s 19 losses in regulation this year are the fewest in the NHL. The Jets have allowed 40 or more shots in their back-to-back wins to improve to 6-0 this season when their opponent has 40 or more shots…Winnipeg has allowed 40 shots or more in three of their last four games…As a team, the Jets have a .954 save percentage in the six games (Hellebuyck – .940; Brossoit – .969)…Brossoit’s 40-save shutout against Vancouver was the fifth time in franchise history a Jets goaltender made 40 saves or more in a shutout and third time since relocation…The Jets have been outshot 261-173 in those six games, but have outscored their opponents 24-12, including scoring five goals in four of the games…The Jets have a 13.9 shooting percentage, while their opponents only have a 4.6 shooting percentage…In four of the six games, the Jets have registered 26 or less shots. The Jets are 7-2-1 against Pacific Division opponents this season and finish a stretch of four consecutive games against Pacific Division opponents tonight…Winnipeg was a dominant 17-4-2 against Pacific Division foes last season and are on an 18-3-3 run in their last 24 games versus the Pacific…Mark Scheifele (5G, 7A) leads the Jets in scoring against the Pacific Division this season with 12 points in 10 games, while Dustin Byfuglien has 10 points (2G, 8A) in nine games…Patrik Laine has seven goals in 10 games against the Pacific Division this season. The Jets have posted a 10-2-0 record in December to climb into first place in the Western Conference…Winnipeg ranks in the top five of several categories this month, including being tied for the most wins. After playing 12 games (10-2-0) in 22 days to begin December, the Jets are scheduled to play four games in a span of 13 days between Dec. 23-Jan. 4…Winnipeg’s three-day break between games in Edmonton on Dec. 31 and Pittsburgh on Jan. 4 is one of two three-day breaks between games in its schedule that isn’t attached to the Global Series, Christmas break, or player break/all-star break…The Jets trip to Pittsburgh on Jan. 4 begins a run of nine games in 16 days before the player break. The Jets are 6-1-0 in games played on Thursday’s this season and have outscored their opposition 29-19 in the seven games…Winnipeg is 7-for-21 (33.3%) on the power play on Thursday’s…Since relocation, the Jets are 56-42-17 in Thursday games. Mark Scheifele is second in the NHL in scoring in December with 20 points (9G, 11A) in 12 games…He has a point in nine of Winnipeg’s 12 games this month and has multiple points in seven of those nine games…Scheifele is sixth in NHL scoring with 49 points (22G, 37A) in 36 games. Blake Wheeler assisted Mark Scheifele’s game-winning goal against the Canucks for his 11th assist in his last seven games…He is tied for the NHL lead with 43 assists in 36 games this season…Wheeler has five three-assist games this season which is tied for first in the NHL…Wheeler has 111 assists during the last two seasons – the most in the NHL – and he is the only player in the NHL to have more than 100 assists during that time frame…Wheeler has 20 primary assists, which is second in the NHL…Wheeler’s 426 career assists is second among right wingers since his rookie season of 2008-09…He has reached 40 assists for the fourth consecutive season and sixth time in his career. Blake Wheeler (18) and Dustin Byfuglien (14) lead the Jets in power play assists this season and are closing in on the career franchise record, which is held by Slava Kozlov (130)…Byfuglien (126) is four power play assists behind Kozlov, while Wheeler (120) is 10 behind. Goaltender Connor Hellebuyck went 7-2-0 with a 2.75 goals-against average and .913 save percentage in his last nine starts before the Christmas break…He is tied for third in the NHL with 16 wins this season and has won a league-high 60 games during the last two seasons. The home team has won nine of the last 11 games between the Jets and Flames. Thirteen of the last 15 games between Winnipeg and Calgary have been decided by two goals or more. The Jets have won four of the last five games against the Flames at Bell MTS Place, but are 0-for-20 on the power play in their last six home games against Calgary. Winnipeg is 3-for-40 (7.8%) on the power play in their last 14 games against Calgary, while the Jets have given up 12 power play goals against during that span. Blake Wheeler is averaging a point per game against the Flames during his career with 18 points (7G, 11A) in 18 games and is a perfect two-for-two in shootouts against the Flames. Both the Jets and Flames franchises originated in Atlanta. Flames defenceman Michael Stone is from Winnipeg and Travis Hamonic is from St. Malo, MB. Jets defenceman Josh Morrissey is from Calgary and forward Adam Lowry grew up in Calgary. Flames forward Michael Frolik played two seasons for the Jets (2013-14 & 2014-15), and amassed 84 points (34G, 50A) in 163 games for Winnipeg. The Flames’ Sean Monahan played alongside the Jets’ Tyler Myers and Mark Scheifele as all three players represented Canada at the 2014 IIHF World Championships. 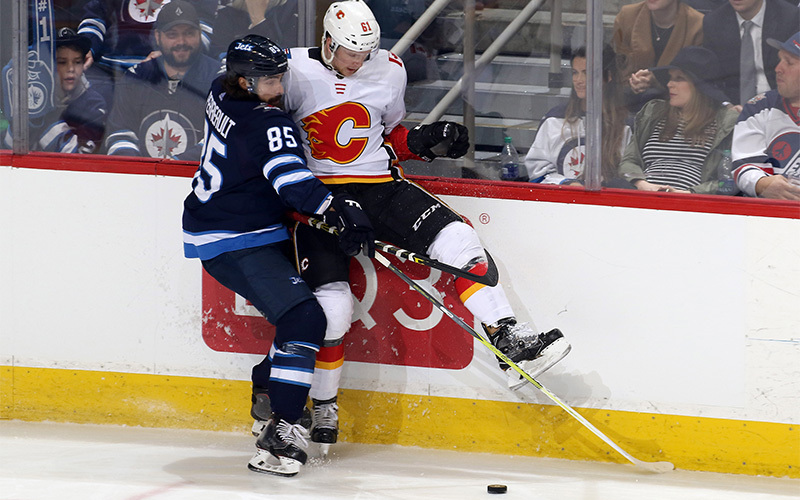 The Jets’ Mark Scheifele, Jacob Trouba and Connor Hellebuyck played with the Flames’ Johnny Gaudreau for North America at the 2016 World Cup of Hockey. Needs four more games played to reach 600 as a member of the Jets franchise. Needs 10 points to reach 100 for his NHL career. Needs four penalty minutes to reach 100 for his career. Needs one win to reach 100 for his NHL career. Needs four points to reach 500 for his NHL career. Needs one more game to reach 400 as the head coach of the Jets. Needs two games played to reach 200 for his NHL career. Needs eight points to reach 100 as a member of the Jets.